Set in the charming town of La Tranch sur Mer along the Western Coast of France, Le Jard luxury campsite is sure to wow guests who seek a beautiful beach side getaway. Accommodation is top-notch, activities are plentiful and there is a wealth of local attractions that will keep all of the family entertained. So don't delay! Book your trip to Le Jard in advance and you could save money on your next French camping holiday. Why Should I Camp at Le Jard? There are 30 mobile homes available in a range of sizes and styles from which to base your stay in the gorgeous surroundings of Le Jard. The Grand Large mobile home is able to accommodate up to six people, and it has an open plan living and kitchen area, microwave, fridge and a spacious decking area. Another option is the Evasion mobile home which has four beds and a pull-out sofa bed, a kitchen with cooking facilities, a large dining table and a private terraced area. All mobile homes and bungalows come with nearby parking spots, so it's easy to unpack the car and settle in to the luxury camping site. Amenities & Where is the Campsite located? What Amenities are There at the Le Jard Campsite? There is plenty to keep you occupied within the 7-acre grounds that make up the beautiful luxury camping resort. The pool complex features water slides, a kid's pool and a Jacuzzi. There is live entertainment held within the resort during the high-season. A kid's play area will help to keep your little ones entertained. Other amenities include a tennis court, games room, and bicycles that can be hired from reception. Laundry facilities such as washing machines and tumble dryers are also available. 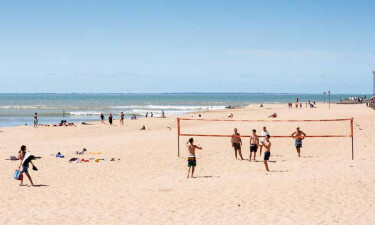 The campsite enjoys a prime location at the southern end of the Vendee in the pretty La Tranch sur Mer. The sandy shores of La Griere beach are just a short stroll away from the LUX-camp. Popular hotspots located near to Le Jard include Les Sables d’Olonne, La Rochelle and Puy du Fou. Yes, Le Jard has a restaurant which offers delicious snacks, breakfasts, lunches and dinners which are served in an informal setting. 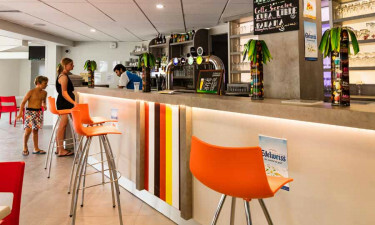 Le Jard also has its own bar where you can enjoy a selection of cold beers, local wines, cocktails and soft drinks; perfect for unwinding in the evenings. Are There Shopping Facilities Available? There is a small grocery store that sells fruit and vegetables, snacks, drinks, and camping essentials. 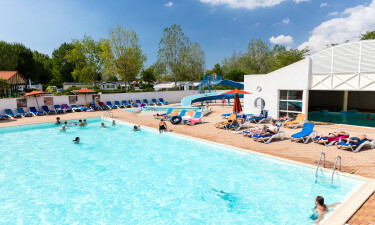 Larger supermarkets, a post office, bakeries, pharmacies, clothing stores and souvenir shops are all just a short drive away from Le Jard luxury campsite, meaning your luxurious holiday break promises to be relaxing, as you can rest safe in the knowledge you have easy access to everything you need.